Get your Gatwick Express train tickets here and enjoy a superb service on the fastest train service between London Gatwick Airport and Central London (London Victoria Station). Book the London Gatwick trains and spoil yourself a little on this premium rail link service into London in less than 30 minutes. Yes. Get Gatwick Express tickets online here. Wondering how to reach central London or anywhere in London from Gatwick? Are you coming into London via this airport? You can get trains from Gatwick to London or London to Gatwick airport on the premium super-fast rail link connecting these two destinations, every 15 minutes. Book your journey now and buy a ticket by clicking here. Where is Gatwick Airport? It is located some 28 miles South of London and lies in the beautiful Brighton - London border. This very efficient and popular service provided by this Express trains to Gatwick mean that holidaymakers or business users flying from Gatwick can execute a quick change at London Victoria from their incoming train, and can be ready for their flight within half an hour. In reverse, it allows for quick turnaround times getting back to the original destination. You can buy the cheapest Gatwick Express train tickets here and catch your train to or from the airport. If you are coming into London from Gatwick, the train departs from the Gatwick airport South terminal. Take the escalator from the arrival lounge down to platform 1 and 2. There you can board a London bound train. The Gatwick Express leaves each terminus every 15 minutes, Monday to Sunday and makes a non-stop journey into London Victoria station, connecting you to a good supply of taxis, buses and the London Underground train network to any part of London and beyond. The first train leaves Gatwick airport station as early as 4.35am in the morning, Monday to Sunday and runs every 15 minutes till about 1.30am. If you are traveling from London Victoria to Gatwick Airport, the first train leaves London to Gatwick at 3.30am. Travelling aboard these trains offer one of the most comfortable and reliable ways of journeying between central London and Gatwick Airport. The seats are well paced, with center table for your laptop or breakfast, and purpose built luggage shelves. The carriages are air conditioned, and you can make telephone calls to your host destination using the in-carriage phone if you want. No wonder they have won the independent National Passenger Survey of British railways and train companies a number of times. By booking your Gatwick Train Ticket online passengers automatically gain a ten percent discount or more. Pick up your ticket on departure point, from any of the stations (Gatwick or London Victoria). If you are still wondering about how to pre purchase tickets to gatwick airport - whether online or while away in your home country, buying tickets to or from London Gatwick couldn't be more easier. Also look out for regular deals and offers, as well as chances to win freebies when you buy online here. There is also a new mobile booking service that also offers excellent discounts and other deals. 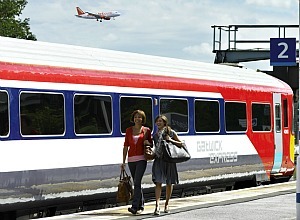 Have you travelled on train from London to Gatwick or Gatwick to London before? What was your experience like? Or Looking to ask questions about any aspect of the journey? Share your thoughts here. Have your say!